Thread: 2DArtist Magazine - May 2008 Issue - Available Now!! The latest issue of 2DArtist Magazine is available and on sale now! Click on the cover below for more details about what's in store this month, and to purchase another content-packed issue from the 2DArtist team. Enjoy!! Welcome, welcome, welcome to Issue 029. It’s a pretty great issue this month to be fair! 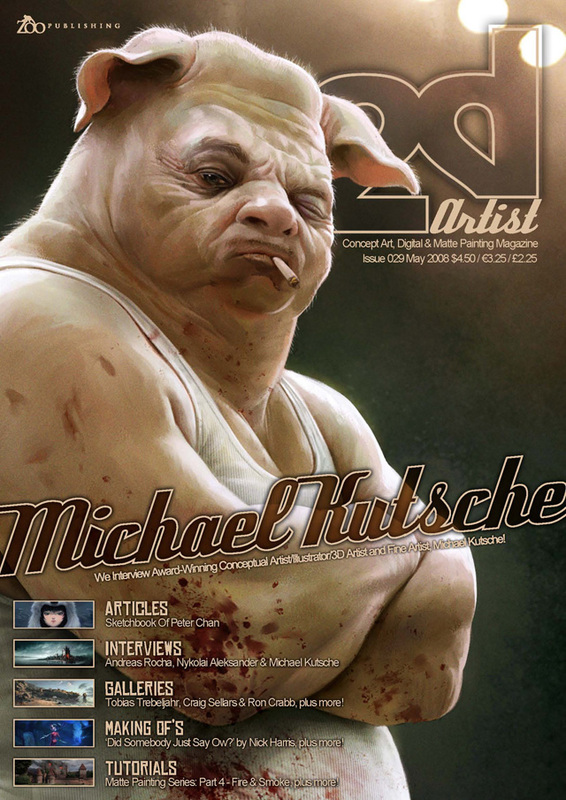 First up, let me mention our interview with the amazing Michael Kutsche, a traditional painter, conceptual artist, illustrator and 3D artist all in one. All of these talents go forth to making the most wonderfully impressive portfolio that we have witnessed in a long time! You’ll have seen his work around the great CG community sites; behind all those fantastic images is an intelligent, creative and down-to-earth artist who has “wowed” us with the interview you’ll find on page 42. In fact, I love this quote from Michael so much I’m going to repeat it: “Art is always a fight for freedom...” This really sums up my own experiences with “Art”, and it’s such a powerful statement that I think we should make it our thought for the month! *grins* In a nice contrast to Michael’s interview, check out our interview with the beautiful Nykolai Aleksander, who dedicated some time to us this month for the interview that you’ll find on page 9. Nykolai seems to be going from strength to strength, both in terms of her artwork and her career as a freelance artist, and the work you’ll find gracing her interview pages is sure to impress! We also had the great pleasure of chatting with popular matte painter, Andreas Rocha, this month. There’s no need to “big up” this name as we are all familiar with this artist’s talents and beautiful portfolio of images, so I will simply suggest that you check the interview out and get yourself all inspired up to paint yourself silly! We aim to please with our tutorials again with another instalment from the lovely Bente Schlick, who teaches us how to paint realistic hands, so head on over to page 88 if you’ve been having problems deciphering your digits and let Bente share some of her tips with you! We also welcome back one of my favourite artists around at the moment, Robin Olausson, who has created a fabulous speed painting for us. Flip to page 97 to see how he tackled this month’s speed painting brief, and see how Mike Corriero answered the same brief but with extremely different approaches and results (we love it when that happens!). If you’re following our tutorial series we’re on Part 4 of Matte Painting with Tiberius Viris and Part 3 of Mike Corriero’s beautifully insightful Creature Concept Design. This month Tiberius blows up our stunning castle and Mike morphs different animals’ characteristics to create some intriguing results! Finally, in this month’s Making Ofs, Louis-Philippe Lebel, Nick Harris and Jeff Haynie all show us the thoughts and working processes behind their great artwork. So enjoy plenty! Ed. And I can never get to www.2dartistmag.com, is that still your url?